HUNTSVILLE, Ala. (NASA PR) — Imagine cramming 20 years’ worth of science experiments — each requiring resources such as water, electricity and data connections — into a few closets in your home. For the crew members aboard the International Space Station, this is a reality. Thanks to an increase in investigations coming in through the National Lab and more demand for exploration technology development payloads, the space station is going to have to make room for a whole new wardrobe. “To solve this problem, engineers at NASA’s Marshall Space Flight Center in Huntsville, Alabama, are developing a new and simplified version of the racks that support these experiments that will add the needed space and resources to accommodate the growing need for science payloads,” said Sean Thompson, Payload Facilities team lead at Marshall. Conducting science experiments in orbit provides the advantage of conducting the experiment with minimal interference from the force of gravity. As the demand for science payloads has grown, projections show that by the end of 2018 the eight existing racks will be at capacity. Science payloads are currently housed on the space station in eight shelving units called EXpedite the PRocessing of Experiments to Space Station Racks, or EXPRESS Racks. These high-tech units are outfitted with everything the astronauts need to maintain experiments in space, including water, electricity, cooling systems, and data connections. The existing racks were transported to the space station over the course of several years, starting in 2001 with the most recent in 2011. The experiments housed in these racks are managed and monitored 24/7 by the Payload Operations Integration Center at Marshall and can be controlled either from the ground or by the station crew. Each EXPRESS Rack — roughly the size of a refrigerator — is equipped with eight lockers and two drawers to house payloads. While the racks themselves remain on the station, the experiments are exchanged in and out of the racks as needed, depending on the experiment’s time requirements. The new racks, developed at Marshall and built by Boeing in Huntsville, are called Basic Express Racks. These racks have been simplified to include only the most commonly required resources and feature more common connectors such as a standard ethernet cable. The first two Basic Express Racks are scheduled to make their journey to the space station in late 2018 aboard HTV7, a Japanese launch vehicle. 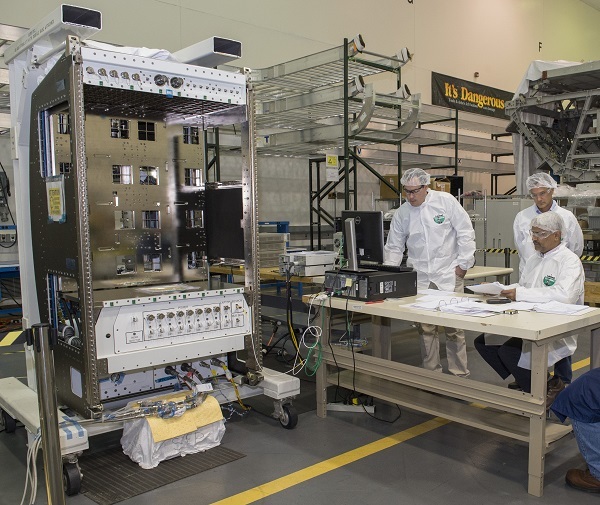 Prior to their launch, the Basic Express Racks will undergo a series of tests at Marshall including end-to-end testing where they will be connected via network to the Huntsville Operations Support Center to simulate the connection to the Payload Operations and Integration Center where the experiments are monitored while in orbit. After testing is complete, the racks will be packed with cargo and then travel to Tanegashima, Japan, for installation into the HTV7 launch vehicle. Spacestations will need smaller racks that can go through the hole in docking ports built to the International Docking System Standard.